LOS ANGELES, CA / ACCESSWIRE / July 21, 2017 / The founders of the Ultimate Wealth Camp, an internet marketing and global joint venture super conference featuring global business celebrities, internet marketers, business experts, and television stars, are pleased to announce that television personalities Vito Glazers and Kevin Harrington will be guest speakers at the event. 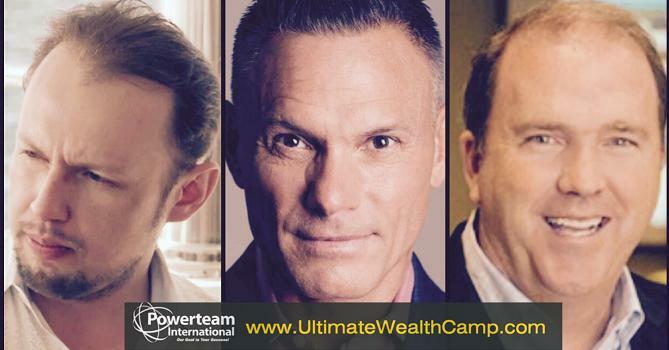 To learn more about Ultimate Wealth Camp, a 3-day event that will take place from July 23-25 at the Renaissance Schaumburg Hotel and Convention Center in Schaumburg, Illinois, or to book a ticket to attend, please visit http://www.Ultimatewealthcamp.com. As a spokesperson for the event noted, Vito Glazers is a TV personality and entrepreneur who received worldwide notoriety after appearing on the highest rated episodes in the series history of Bravo's "Below Deck" and starred in WE TV's, "Mystery Millionaire." He will be sharing information about how to use PR and media to launch or grow a business. Kevin Harrington is the founder of As Seen On TV. "He was one of the founding cast members of the television series 'Shark Tank' and has an estimated net worth of $450 million," the spokesperson noted, adding that Harrington is credited with inventing the infomercial. "He will be sharing strategies about how to raise venture capital to launch or grow a business." The 3-day event will be hosted by Bill Walsh, who is founder and CEO of Powerteam International and America's small business expert. His live events are renowned as some of the most exclusive and well attended events in the entrepreneurship space, the spokesperson noted, often attended and hosted by celebrities, investors and business icons. "Bill Walsh has appeared on dozens of television and radio shows and has received many honors from the entrepreneurship community for his commitment to helping individuals attain financial independence," the spokesperson noted. Other speakers include Austin Walsh, Erik Swanson, Anil Gupta, James Dentley, Neli Vazquez, who is founder of A Safe Haven Chicago, and Armando Montelongo. These top experts in their fields will show attendees how to use Internet marketing and strategic partnerships to either start or grow their business. Guests who have attended past Ultimate Wealth Camps have left glowing reviews, referring to it as a "life-changing event." "For anybody who wants to learn about business and how to become wealthy, I highly recommend that they come to this event," a past attendee noted in a review. Ultimate Wealth Camp is a 3-day Internet marketing and super conference that will take place from July 23-25 in Schaumburg, Illinois. The event will kick off with the Mega Wealth Party, where attendees can mingle with successful entrepreneurs. The party will be followed by two full days of the intense Ultimate Wealth Camp Sessions that will feature a number of expert speakers and leaders. For more information, please visit http://www.Ultimatewealthcamp.com.